Learn more about the A Street Rear project by clicking here to view it in our online portfolio. Mark Erlich, Executive Secretary-Treasurer of the New England Regional Council of Carpenters released the following statement regarding today's Supreme Court decision on the Affordable Care Act. "We are pleased that the Supreme Court did not strike down the ACA. When Carpenters work, we have great health insurance, but the costs continue to skyrocket. Too much of our contract increases have gone to fund health care over the years. The ACA has the potential not only to extend access but to control costs and we support efforts in that direction." Learn more about the Berklee College of Music dormitory project by clicking here to view it in our online portfolio. Congratulations to Carpenters Local 33 in Boston, which was chartered on July 24, 1882! That's 130 years of representing the interests of Boston Carpenters! The Worcester City Council this week voted to move forward with a newly proposed Responsible Employer Ordinance for public construction in the city by a 9-1 vote. The result comes after an anti-union contractor association and corporate-backed "research" group threatened long, expensive litigation if the ordinance was passed. The City of Worcester has had a Responsible Employer Ordinance in place since 2005, but the City Manager had suspended portions of it recently out of concern that the entire ordinance would be eliminated on legal challenge. Councilors worked with various groups to re-write portions of the ordinance--most significantly to retain the language requiring contractors to participate in apprentice training programs--to put it on safer legal ground. The Merit Construction Alliance, which represents nonunion contractors, has been using the Worcester Regional Research Bureau to back its opposition to standards for public construction in the city. According to GoLocalWorcester.com, the Worcester Regional Research Bureau is "privately funded by a host of corporate sponsors." Their top sponsors consist mostly of banks, law firms and insurance companies. When a City Councilor asked for clarification on who the group was and what function it serves, the head of the organization claimed she was somehow being "attacked" and blamed unions. In arguing that the newly drafted REO wouldn't stand up to legal scrutiny, the group's own work seemed to be less than convincing. Union carpenters were very active in pushing for passage of the revised REO, participating in rallies, attending hearings and lining up support from Council members. Supporters also got a boost from Susan Mailman, the president of Coghlin Electrical Contractors, who wrote a convincing opinion piece in the Worcester Telegram and Gazette detailing why opposition to the REO was built on false assumptions. The New England Carpenters Labor-Management Program is proud to provide an interesting look at the work of union contractors and carpenters at the Old Colony Housing Project in South Boston. The time lapse video, synchronized to music was shot over the course of a year, during the project's first phase. Suffolk Construction was the Construction Manager. Union carpenters employed by Suffolk Construction and numerous subcontractors were proud to recently complete Phase One of the redevelopment of housing at Old Colony in South Boston. The project involved demolition of old buildings and construction of 116 energy efficient affordable apartment units as well as a 10,000 square-foot community center and other improvements and amenities. 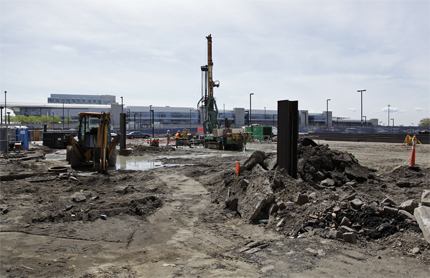 As the largest property managed by the Boston Housing Authority, demolition and construction was completed on a 15 acre occupied site containing 850 housing units. The project changes the face of a community and the lives of many who will live there. Video of the three buildings in this piece was gathered over the course of a year, from December 2010 through December 2011 during almost weekly visits. Videographer Ellen Webber of the New England Carpenters Labor Management Program produced the piece. See more pictures of this project in our online portfolio. National television talk show host Cenk Uygur this week hosted NERCC Representative Tim Sullivan on his show "The Young Turks" to talk about events at Stamford's Harbor Point development. The two talked about how the project is undermining area standards for carpenters' wages and benefits and how instead of local citizens voting on the project, votes were cast by a single lawyer representing a handful of corporations. That's right, corporations voting, not citizens. The Simon Property Group opened the doors on its new Merrimack Premium Outlets yesterday, but the first ones at the door weren't eager shoppers looking for deals, they were union carpenters giving out warnings. Members are upset that Simon failed to live up to commitments it made regarding how the property would be built. “The developer came to us…and asked for our help getting the project through a complex zoning and planning process that included a city-wide vote that produced the highest voter turn-out in Merrimack’s history,” said Liz Skidmore, NERCC Representative. Simon is still trying to have it both ways. When carpenters and other building trades workers protested at the mall's opening, the company claimed it used some union workers. At the same time, they were trying to get police to strip union members of their rights to demonstrate. The demonstration was covered by the Merrimack Patch. Learn more about the Natcik Hich School building project, by clicking here to view the project in our portfolio. A large group of carpenters are demonstrating on Newbury Street in Boston today against Callahan, Inc. The Bridgewater-based contractor is renovating a building that will feature housing and retail space. The company has a history of undermining industry standards for carpenters' wages and benefits. The company has been debarred for making misleading statements to qualify for a project and is embroiled in a controversial project with the South Shore YMCA in Quincy. "The recent disclosure of questionable ethics on the part of YMCA board members comes as no real surprise to the carpenters union. During the general contractor selection process for the Quincy project, we asked that the process pass reasonable standards of integrity and honesty. Instead, they chose Callahan, Inc., a contractor determined to have lied under oath to qualify to bid on a school project in Hanover , where there were multiple violations of state and federal law. "In the past few years, members and apprentices of the carpenters union have donated over $100,000 in free labor to the South Shore YMCA for work done at the Germantown Community Center and Camp Burgess . Yet we, often described as overpaid, were denied a legitimate opportunity to work on the new YMCA, while insiders collected over $2 million in fees. The Y’s mission statement reads in part; “To put Christian principles into practice…” I think they forgot." In Hanover, Callahan was found to have made misleading statements to justify its qualifications to bid on construction of a new High School. The town successfully fought to have put aside opinions by the Attorney General's office and a suit brought by union carpenters in Hanover that the project should be rebid. Though Callahan was awarded the job, they were debarred from bidding public work as a result of their actions and the project was not without further problems. Two subcontractors working on the Hanover High School project for Callahan, Inc. were cited for violations of wage and hour reporting laws. 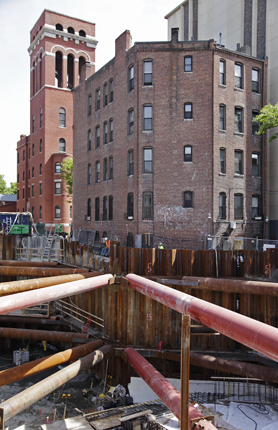 Action Floors was issued a $2,000 penalty for intentionally failing to submit true and accurate certified payroll while Superior Foundations was found to have intentionally failed to pay proper prevailing wages on the project. Superior has been issued a $2,000 penalty for the violations and order to pay $3,802.94 in restitution to workers who were cheated. Superior was also cited for prevailing wage violations for work they did at the Swansea Police station. Rhode Island Governor Lincoln Chaffee and Providence Mayor Angel Taveras were among those on hand today for a ceremonial groundbreaking for The Highlands on the East Side in Pro. The project is a renovation of senior housing that will become an assisted living facility. The project is being financed by the New England Carpenters Pension Fund and led by union general contractor CWC. It will provide an eventual monetary return to the Fund while providing immediate employment opportunities to union carpenters, economic activity for Providence and badly needed housing for an aging population. The building is owned by Halkeen Management if Norwood, Massachusetts and will eventually provide 64 unites of housing, including Alzheimer's and Dementia apartments in a variety of layouts. The Carpenters Pension Fund is investing in the project as part of their diversified investment portfolio. The groundbreaking was covered briefly by Providence Channel 10. Members from Local 118 gathered with other Building Trades members in front of the Merrimack Premium Outlets in New Hampshire to protest Simon Property Group’s broken promises and lack of support for union workers. Simon Property Group is building the $100 million dollar outlet mall, which will be home to more than 100 high end and designer retailers. Local union members first stepped up to support the project in 2005. “The developer came to us…and asked for our help getting the project through a complex zoning and planning process that included a city-wide vote that produced the highest voter turn-out in Merrimack’s history,” said Liz Skidmore, NERCC Organizer. Instead of hiring local, responsible contractors, Simon Property Group hire out-of-state contractors who brought out-of-state workers, a number of whom are illegally misclassified as independent contractors and aren’t covered by workers’ compensation. Simon management released a statement in response to the demonstration. Construction workers from about 30 states have been helping to create the new shopping center, including tradesmen from as far away as Arizona, California, Nevada and Texas. Various building trades members gathered at the mall to bring to light their frustrations from these broken promises, in an effort to drive more local jobs as fit out work continues on site. The Merrimack Patch ,Nashua Telegraph , and Union Leader covered the rally. Members were meeting at the site once again this morning and are considering a rally on opening day at the mall, which is scheduled for June 14th. Carpenters in Norwalk, Connecticut held an area standards demonstration to raise awareness about the practices of Allstate Interiors, based out of New York. The drywall contractor is working at Maplewood at Strawberry Hill. The $17-mllion project is converting a former elementary school into an assisted-living facility for the elderly. Allstate does not meet area standards for wages and benefits. Workers have reported making as little as $10-$12 an hour on construction projects. The Norwalk Hour covered the rally.